For more than 40 years, Elliotts has been manufacturing and distributing quality safety gear to the Australasian safety market. Our passion for quality and reliable service is matched by world class partnerships and ongoing research to find innovative safety and care technologies. Elliotts quality safety gear allows you to take care in any situation. By developing partnerships with experts and global leaders in specific industry segments, Elliotts now represents a number of global brands including; ONESuit Hazmat Chemical Suits by Saint Gobain, FR Workwear from Walls FR and PureSport from Human Performance Labs in the USA. Elliotts Managing Director Anthony Elliott believes that partnering with organisations like Pyramex will deliver significant benefits to both parties. "Partnering with Pyramex Safety Products was an easy decision given the synergies between the companies," said Mr Elliott. "Pyramex's primary focus is always on the customer, listening to their feedback and then developing solutions that people want to wear. This approach is consistent with our "Take Care" philosophy, he said. According to Mr Elliott, a key determining factor was that Pyramex was focussed on safety, comfort and style and that Pyramex are focused on innovation and product development. "The Pyramex philosophy of creating safety products that people want to wear was so reassuring to hear, they have an amazing understanding of what the wearer wants, the feedback from their global customer base combined with the expertise of their Product Development Team ensure products are firstly safe, high quality and stylish," said Mr Elliott. "From my perspective, Pyramex eyewear is the most comfortable eyewear I have ever worn," he said. All Pyramex products are independently tested and certified to Australian/ New Zealand Standards by BSI Benchmark. 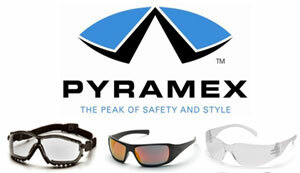 Pyramex is the 4th largest supplier of protective eyewear and has 20 years of experience in the safety industry. Pyramex has a global network of distributors covering the USA, Canada, Europe, South America, Africa and now Australia, New Zealand and New Caledonia.